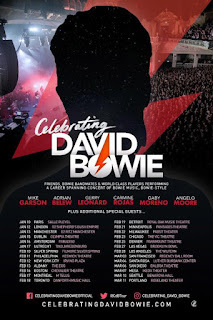 Home / -Touring- / David Bowie / Touring / Former Collaborators to Tour in "Celebrating David Bowie"
Former Collaborators to Tour in "Celebrating David Bowie"
VIP tickets will go on sale Tuesday, September 26 with the general on sale starting Friday, September 29 at 10:00 AM local time. More than just a mere salute, Celebrating David Bowie keeps David's music alive with musicians who worked closely with him throughout his career and other top musicians greatly influenced by him. Bowie touring and recording keyboardist Mike Garson, who collaborated with Bowie for longer than any other player, will be heading up the band along with previous Bowie band leaders, guitarist/vocalist Adrian Belew (Sound & Vision tour) and guitarist Gerry Leonard (A Reality tour). Between them, the three musicians have over 30 years experience of recording, writing and playing live with Bowie. Joining Garson, Belew and Leonard will be Bowie's Let's Dance and Serious Moonlight tour bassist Carmine Rojas as well as CdB 2017 standouts Fishbone's Angelo Moore and 2017 Grammy Nominee Gaby Moreno, as well as special guests and other former Bowie band members who will make surprise appearances along the way. CdB creator and producer Angelo Bundini (aka guitarist Scrote) is also back and excited about the concept for the new show. "After the last tour, I didn't really imagine playing more shows because it was insanely difficult to pull off. David's last tour was in 2004, so I began to wonder what he might do if he were to tour again today. That's what we're presenting in 2018." "I have worked with over 1,000 singers but never anyone like David," Garson says. "He had an infinite source of music flowing through him, and his creativity was boundless. His sharing of the stage with his musicians was extraordinary, and he was a team player. That is why we need many singers to encompass his work." "With such a large catalog to choose from, different songs affected us and the audience in varying measure," adds Belew about the shows earlier this year. "It's always amazing to feel the excitement of an audience beamed directly at you. Pure adrenaline! So much love for David." Fishbone's Angelo Moore recalls: "One of the things that stuck out while abroad was our group visit to the David Bowie Is... exhibit in Tokyo and how they cover so much of his life, music, fashion, and creative processes. I'm excited we will be doing more of his unique aesthetic in our upcoming shows." "It was an incredible and emotional ride for me, " Gaby Moreno remarks, "Sharing the stage with some of the most brilliant musicians, playing these iconic songs from one of the best artists this world gave us, is something quite unlike anything else I've ever experienced." Previous special guests on CdB shows have included: Sting, Gary Oldman, Seal, Perry Farrell, The B-52's' Kate Pierson, Ewan McGregor, Simon Le Bon, Gavin Rossdale, La Roux, Joe Elliott, Mr Hudson, Gail Ann Dorsey, Spandau Ballet's Steve Norman, Corey Taylor, Ian Astbury, Darren Criss, Tony Hadley, Living Colour, The London Community Gospel Choir, and The Harlem Gospel Choir, among many others.